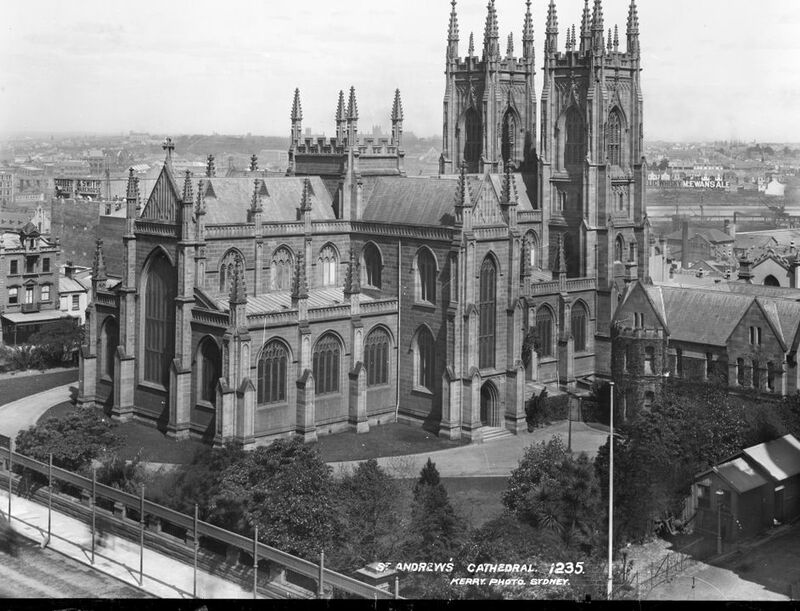 Glass negative, full plate, 'Saint Andrew's Cathedral', Kerry and Co, Sydney, Australia, c. 1884-1917. Silver gelatin dry plate glass negative in landscape format. The image depicts Saint Andrew's Cathedral in George Street, Sydney. The image is taken from George Street looking south-west. The Gothic Revival style cathedral dominates the image. The Sydney Town Hall can be partially seen next to the cathedral on the right side of the image. The urban environment of the Sydney city area is depicted in the background of the image. The area is densly populated and numerous commercial and residential buildings can be seen. The caption, studio number and studio mark are inscribed on the reverse of the negative. Inscription in plate emulsion verso upper right corner, scratched by hand '1235'.